In our day today computing there many scenarios where we may want to kill or terminate an application or process at a scheduled time. By using the Windows Task Manager we can only kill an application or process immediately but we cannot schedule the kill or termination for a later time. Now comes the freeware utility Process Assassin that does this effectively. 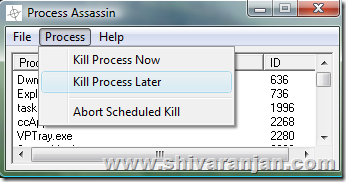 If you would like to kill an application immediately then you can use the option 1 which terminates the process immediately. Use the option 2 to schedule and kill an application at a later time. The option 3 can be used to abort the scheduled termination of application that you have already activated. We tested this utility in Windows XP and Windows Vista it works without any flaws.